LAS VEGAS — Chris Weidman has never been known for his wheel kicks. But he was losing his UFC middleweight championship fight against Luke Rockhold in the third round of their co-main event at UFC 194, so maybe it was a sense of desperation that caused him to throw it. Rockhold slipped the kick, pounced, took Weidman to the mat, and the rout was on. Weidman lasted to the end of the third round, but couldn’t get out of the fourth. 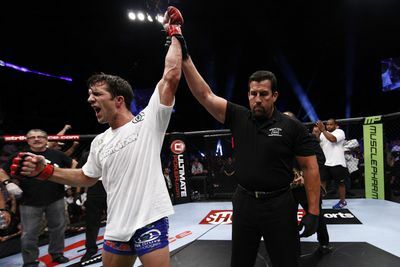 Rockhold finished the job at 3:12 of the fourth round at the MGM Grand Garden Arena on Saturday night, as Rockhold won via TKO to win the championship. Weidman got off to a solid start in the first round as he mounted as standing Weidman and got him to the mat. But by the middle of the round, Rockhold had turned the fight in his favor. He twice landed guillotine chokes and won the round. In the second round, Rockhold peppered a visibly slowing Weidman with brutal body kicks. In the third, Rockhold also slowed, giving Weidman a window to get back into the fight. But Weidman threw his fateful, fight changing kicks. Rockhold rained down uncontested punches and elbows. Herb Dean, however, did not wave off the fight. “I was surprised it wasn’t waved off,” Rockhold said. “But I know when I get into top control there’s no one who can stop me. Weidman was out on his feet and it was a matter of time before Rockhold (13-1) finished the job and Weidman went to his first career defeat. Weidman had held the title since July, 2013, when he defeated Anderson Silva for the belt.